[RALEIGH] The 2018 Short Session of the NC General Assembly ended June 29th, but no matter how the Nov. 6thmidterm elections turn out, the same state lawmakers will be back for at least one more lame duck session to write laws based on whichever of the six NC constitutional amendment referenda pass during the election. This gives current Republican lawmakers a chance to set in constitutional stone the laws most important to them if the Democrats take over the state House or Senate, or both. Democrats argue that no new laws should be passed prior to the January 2019 long session, but of course, Republican leaders aren’t listening. [RALEIGH] NC Dept. of Public Instruction Supt. Mark Johnson announced last week that 61 positions were being eliminated from the state education agency, affecting some 40 employees and 21 vacant positions in Educator Support Services, which focuses on low performing schools throughout the state, and Information Technology. The cuts were required by the legislature, which slashed 6.2 percent of the agency’s funding. [ZEBULON] People are hailing the selfless act of a 36 year-old man who saw a young child drowning in the water at Little River Park in Zebulon, and without hesitation, jumped in and save the 8-year-old boy, only to then drown himself. Jeremie Earp is now being called a hero for giving his life for a child he didn’t even know, his friends are saying. Meanwhile, the child he rescued is said to be doing well. Nothing has sent more shockwaves across the political spectrum this midterms election season than the unexpected announcement U.S. Supreme Court Justice Anthony Kennedy – who many considered a moderate swing vote on the nine-justice High Court on issues of civil rights, abortion and education – would be retiring on July 31stafter 30 years, allowing Pres. Trump to chose his second conservative justice this term, and definitely swinging the Supreme Court to the right. Trump is expected to announce his nomination on Monday, July 9th. Senate Democrats have vowed to do everything they can to block the nomination, but procedurally, there’s not much that c an be done, and Senate Republicans promise to take up the nomination before January. Progressive groups believe that once Trump gets his choice on the High Court, canon law like a woman’s right to choose via Roe v Wade will be overturned, in addition to other civil rights laws. considered the most powerful member of the High Court precisely because no one knew just how he was going to vote on a case before the Court. In terms of civil rights, Kennedy has been a strong proponent for gay rights and gay marriage. In a 2000 decision, he agreed that hate crimes should allow racial intent to affect sentencing, and he upheld that a suspect should be read his/her Miranda rights upon being arrested. 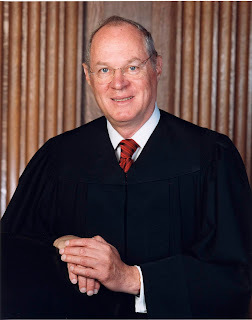 And even though, he wrote the 1986 majority opinion upholding Michigan’s ban on affirmative action in college admissions, Justice Kennedy did say that “…the consideration of race in (college) admissions is permissible,” as long as the voters don’t say otherwise. 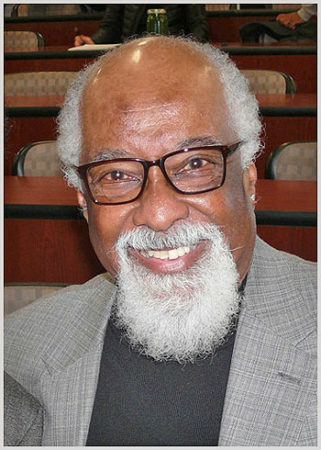 Irving Joyner, law professor at the North Carolina Central University School of Law, and chair of the NCNAACP Legal Redress Committee, says Kennedy will be deeply missed. “Many rights, which citizens enjoy today, will be curtailed and the protections presently provided to African Americans and other minorities by past Civil Rights decisions and statutes are in immediate and imminent danger of being repealed or significantly diminished,” Prof. Joyner warned. And NCNAACP Pres. 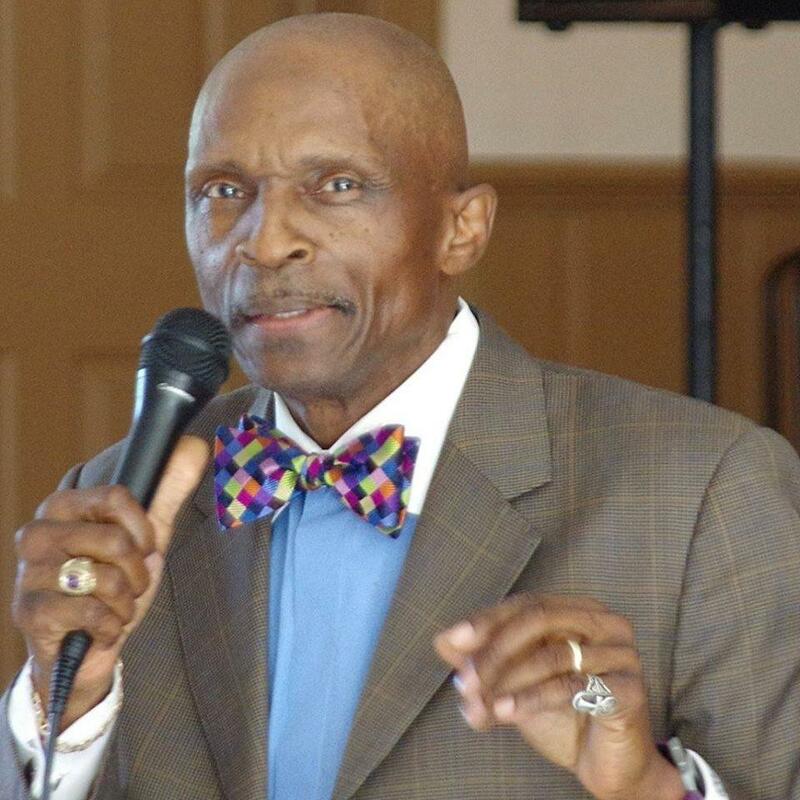 Spearman urged citizens to be proactive, starting now. Some have criticized it for its haste and keeping important legislation close to the vest, then springing it at the last minute with nary a hearing or debate. Other have criticized the 2018 NC Legislative Short Session for trying to codify long held agenda items Republican could not pass as state statute without the courts getting involved, into the state Constitution. But one thing is for certain, many observers note, is that Republican legislative leaders continued not to be friendly to the state’s African-American community. First, the state House passed changes to the early voting law, inexplicably eliminating the last Saturday before Election Day, and requiring all early voting sites to remain open from 7 a.m. to 7 p.m., effectively forcing many counties not to open as many because of lack of volunteer staffing. Eliminating the last early voting Saturday was seen as a direct slap-in-the-face to African-American voters, because it traditionally is the most popular early voting day for them to come out. Only after the bill was sent over to the state Senate did cooler heads realize that it might be too easy for a court to see what the House had done, and that the last early voting Saturday was restored. After the House finally complied, the law goes into effect this October. Black Democrats in both the House and the Senate fought mightily against the constitutional amendment placing voters to approve voter ID, details to be filled in later. The 2013 voter ID law passed by the Republican-led General Assembly was struck down in 2016 in federal court as being directed towards suppressing the black vote with “almost surgical precision,” but that didn’t Republicans from passing this referendum question for the November elections, hoping that if citizens say “yes,” lawmakers can come back on November 27thin Special Session, and design another voter ID law to their liking. On Friday, both the state House and Senate went into special joint session to decide which of Gov. Roy Cooper’s nominations as Special Superior Court judges they would confirm. Gov. Cooper nominated three – a white male, a white female, and Bryan Beatty, an African-American who has previously served as a commissioner on the NC Utilities for ten years, and director of the State Bureau of Investigation, and secretary of the state Dept. of Crime Control and Public Safety. Republican lawmakers, who hold the majority, voted Bryan Beatty’s nomination down without explanation. And finally, Republicans allegedly “…hung fliers around the General Assembly…with the names and faces of [three] prominent African-American judges and attacked them by name, “ according to Robert Howard, communication Director for the NC Democratic Party. 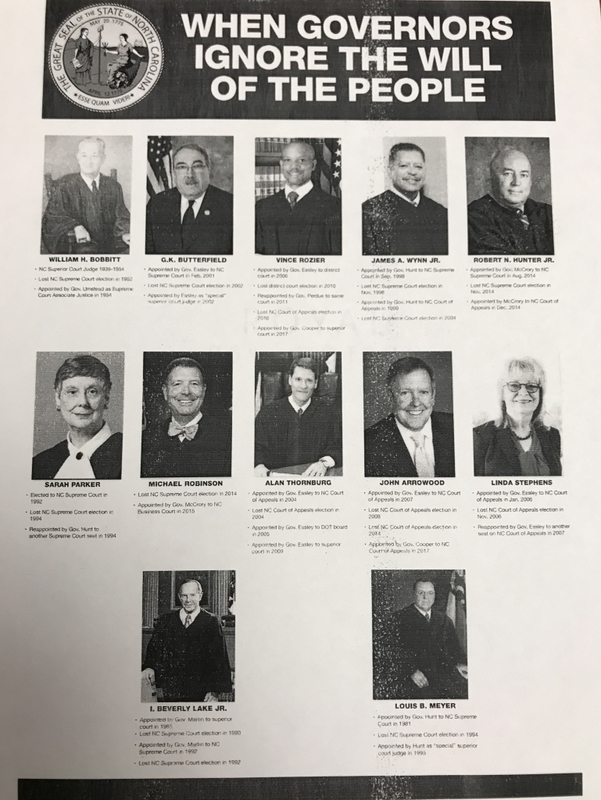 Indeed, a picture of the flier shows 12 current and former NC judges, three of them black. Current Congressman G. K. Butterfield (D-NC-1) is pictured, with the caption noting that former Gov. 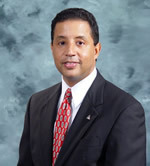 Mike Easley appointed him to the NC Supreme Court in Feb. 2001, as well as a Superior Court judge. The flier also shows Superior Court judge Vince Rozier, who was appointed by Gov. Easley in 2017, and current US Fourth Circuit Judge James A. Wynn Jr., who was first appointed by Gov. Hunt to the NC Supreme Court in 1998, the appointed to the NC Court of Appeals in 1999. 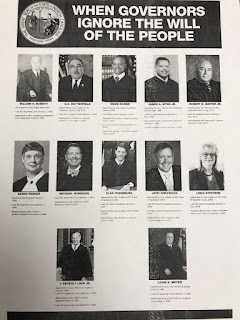 The title of the flier – “WHEN GOVERNORS IGNORE THE WILL OF THE PEOPLE.” All of the judges and former judges on the flier were once appointed by Democratic NC governors. The NC Republican Party was asked to comment on the flier, but no comment was forthcoming by deadline.